I've been trying really hard to work through my stack of recipes for experimenting. This one was labeled as breakfast for dinner, which was FANTASTIC, but it would also be REALLY GREAT for a Sunday brunch or holiday brunch since it can be prepared in advance and reheated as needed. Coat 15x10 jelly roll pan and 4 large ramekins with PAM. Place bread cubes on jelly roll pan and bake for 10 minutes, turning as need or until lightly toasted. 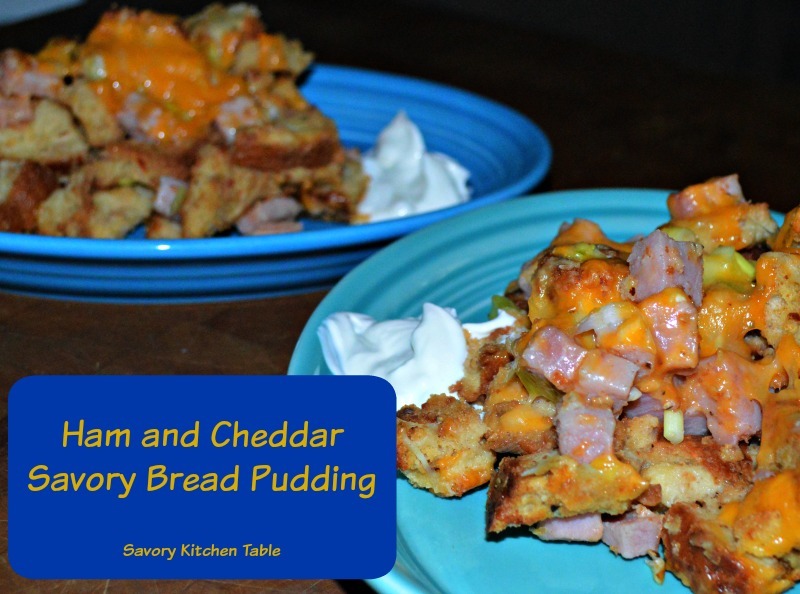 Combine bread cubes, 3/4 cup cheese, 3/4 of the onions, milk, chicken broth, pepper, ham, and egg yolks, tossing to mix and coat. In a small bowl beat egg whites at high speed until foamy. Spoon 1 cup into prepared ramekins or see note. Top the ramekins with the remaining cheese and onions. Bake for 20 minutes or until toasted brown. NOTE: If I'm cooking just for us I will use a shallow baking dish and cook it as a casserole. By using the shallow baking dish you get a toastier crunch effect. *ALSO works well with a really SOUR sourdough, but you'll want to add some extra seasoning!